From Earth To Plate: BEAUTIFULLY FAT! "OMEGA 3,6,9 EXPLAINED"
Over time fats have been misconceived as being bad for our health, building a fear of the sheer sight of the word FAT & has made society avoid them in their daily diet at all costs. Did you know? Some fats like EFA’S e.g. Essential Fatty Acids are actually good for the body & imperative in our daily diet as our good fats protect & coat every cell in our body hence needing them on a daily basis. Fats like our Omega 3, 6, 9 are essential in our every diet. Fats are a vital source of energy & also are responsible for the transport of fat soluble vitamins around the body like vitamins A, D, E, K & some antioxidants. The Omega 3, 6 and 9 groups all contain essential fatty acids necessary for good health. Omega fatty acids are polyunsaturated fats, they are healthier than saturated fats and have many metabolic functions. Omega fatty acids may be helpful in a number of conditions such as, rheumatoid arthritis, depression and inflammation. They are necessary for growth and development, especially in the development of nervous tissue, cognitive function and emotional health. Below are some health benefits associated with our good fats. Brain – Fats compose 60% of the brain and are essential to brain function, including learning abilities, memory, cognitive & mood. Strong mind, strong body. Cellular – Fatty acids help your cells stay movable and flexible, as well as being responsible for building cell membranes. Skin that shines with abundance & vitality. Heart – 60% of our heart’s energy comes from burning fats. Specific fats are also used to help keep the heart beating in a regular rhythm. A Healthy Heart Smiles & Great for High Cholesterol. Nervous System – Fats compose the material that insulates and protects the nerves, isolating electrical impulses and speeding their transmission. Hence being essential for a balanced nervous system. Lungs – Lung surfactant, which requires a high concentration of saturated fats, enables the lungs to work and keeps them from collapsing. Strong lung function means more fresh oxygen pumping around the body. Organs – Fats cushion and protect our internal organs from damage & oxidative stress. Immune System – Fats ease inflammation, helping your metabolism and immune system stay healthy and functioning. Not to mention keeping you warm. 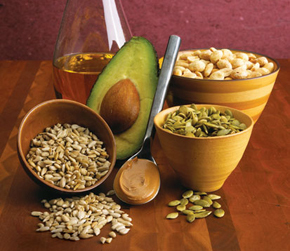 (foods to include) - These are all high in Monounsaturated & Polyunsaturated fats. Raw Nuts - Roasted nuts change the fat molecule making it a bad fat. Raw seeds - Roasted seeds change the fat molecule making it a bad fat. Fresh Reef fish - Always go for small reef fish to avoid heavy metals & always buy sustainably. Extra Virgin Cold Pressed Olive Oils, Avocado Oils. High Strength Fish Oils - Always choose Ultra purified & sustainable. Udos Oil Omega 3, 6 & 9 Plant/Seed based oil & caps. Bad Fats: Saturated fats are needed at small amounts in the body & should be avoided at high amounts. Enjoy your good fats & include in your daily routine. Your body will thank you for it in many ways then one. If you have any questions please feel free to comment & I will get back to your response as soon as possible.